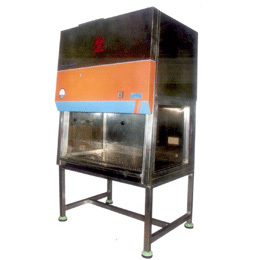 PSIClass II Type B2 cabinet all inflow and down flow air is exhausted after HEPA filtration to the external environment without recirculation within the cabinet. Type B2 cabinets are suitable for work with toxic chemicals employed as an adjunct to microbiological processes under all circumstances since no re-circulation occurs. In theory, Type B2 cabinets may be considered to be the safest of all Class II biological safety cabinets since the total exhaust feature acts as a fail-safe in the event that the down flow and / or exhaust HEPA filtration systems cease to function normally. However, Class II Type B2 cabinets are, in practice,difficult to install, balance and maintain. (To measure differential pressure across the supply HEPA filter). Motor Blower Assembly: – Statically & dynamically balanced with suitable rating and size. (Induction motor with centrifugal blower) A Mounting unique spring suspension system to take care of vibration and noise.